These excerpts of Ms. Schildt's memoirs are reproduced with the permission of the author. Let’s start with the nuts and bolts. 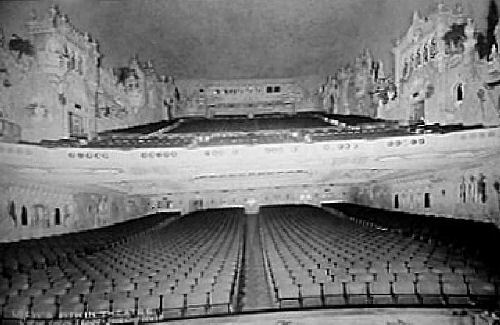 The dramatic Loew’s Pitkin Theater on Pitkin Avenue between Legion Street and Saratoga Avenue, backed by East New York Avenue, was born on Saturday, November 23, 1929 precisely 11 A.M. Its seating capacity of 2,827 people included a big auditorium below, a sizeable upstairs balcony section and several loges. In its almost four-decade existence as a movie theater it played the top tier movies immediately after their New York movie house runs. 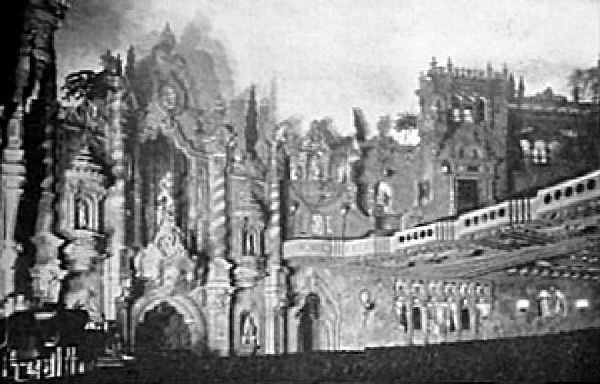 In addition to 5-act vaudeville shows, the programs also included the ever-present Henrietta Kamern at the organ, a Robert Morton classic pipe organ which was raised and lowered as needed. 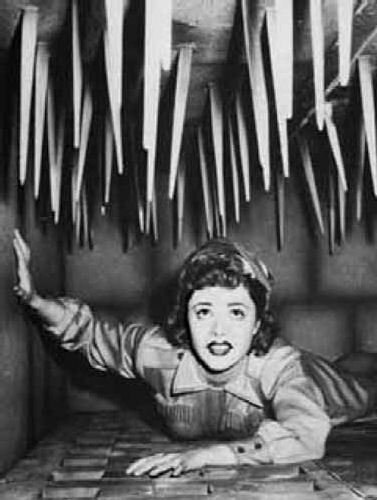 Henrietta accompanied the Follow the Bouncing Ball singalongs, and served up rollicking music at the beginning and end of major features. Occasionally the theater featured Beauty Contests and eager younger movie crazed girls would submit their photos which were displayed in the lobby. The concession stand served up drinks, large sized candy (including jumbo Tootsie Rolls, huge boxes of Nonpareils chocolate topped with white sugar pellets, and of course, freshly made popcorn. Ushers were elegantly dressed good-looking young males and reportedly used this opportunity to meet and date young ladies of the neighborhood. The building, with its Mayan inspired exterior was ringed on its Pitkin Avenue side with fine retail establishments. Today, the inside has collapsed but retail establishments of a lesser order still do business on the outer side of a fake wall. These are the nuts and bolts. But in its heyday, in its glory, it was a whole lot more than the sum of its parts. The Loew’s Pitkin was a pleasure palace, an escape from the struggles and humdrum existence of this working class neighborhood, its luxurious appointments and décor alone a sharp contrast to the squalor in which many lived. of the Loew’s Pitkin, but the scenic magnificence of the surrounding sides. Henrietta and her beautifully stage-lit Robert Morton organ would emerge from the left front. And the orchestra pit was in front of the elaborate stage, in the center. There was a Loew’s Pitkin for everyone. For the reasonable price of admission, adults could enjoy at one sitting, top rung dramas, comedies, lavish MGM musicals, mysteries or westerns, paired with lower budget B pictures (some of which are now prized as “film noir” classics) along with the latest newsreels and, depending on the length of the main feature, additional short subjects. Everything about the experience, from the moment you came up Pitkin Avenue to the ticket booth, to your entrance, to the show itself was an escape. You walked on lush carpeting, sat in comfortable seats and enjoyed the best Hollywood could create. 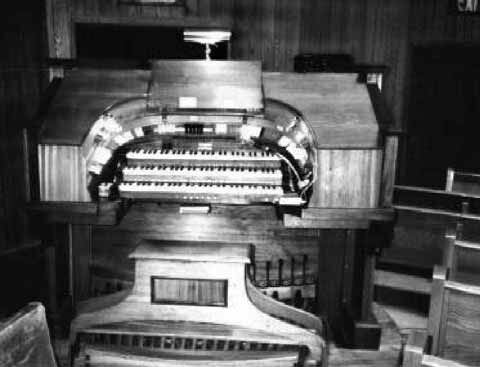 This is a similar organ to the model played by Henrietta Kamern. to see our hard-working mother “all dolled up” for an evening at the movies by herself. Saturday night was date night for young adults and teens. Unlike today, it was a time for dressing up, making up and showing off. Males wore shirts, ties and suits, adding dress coats with white silk scarves in winter. And it was cocktail dresses and fancy hairdos, jewelry and the whole nine yards for young ladies. female anatomy. She knows what’s happening and has three options. She can push the hand firmly away, leave it there passively but not respond, or jump right in there with him and “make out.” If the hand is rejected, he tries blowing in her ear and looking soulfully into her eyes, especially in conjunction with a romantic portion of the movie. The balconies were the places of choice for serious ”making out” or heavy petting. During breaks or scheduled intermissions, you went to the lavish restrooms, and combed your hair to be ready for the next round. Girls would re-do their makeup sitting at mirrors, surrounded by flattering lighting. If a girl came by herself, and sat next to an empty seat, she would be easy prey for any unattached male who would sit down next to her. And the games would begin. Same choreography. The response was up to the girl. And if she really disliked the fellow and he didn’t get the message, she would call the usher, to make him either vacate the seat or leave the theater. The balcony section was popular for this sort of activity - in general the loges were too expensive, and the main section too out in the open. 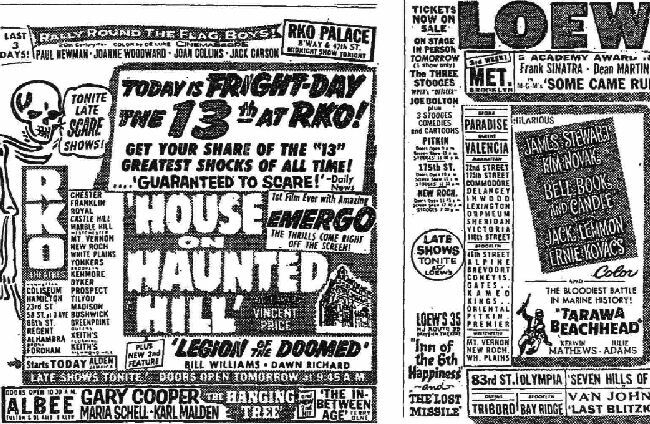 The kiddie matinees on weekends were a whole different matter. If the main film was not considered appropriate for young eyes, or a hot kid movie was just released, that would be part of the double bill. A special section was roped off for kids and the aisles were heavily patrolled by searchlight-bearing ushers and matrons. Kids would come in beginning with the opening of the doors around noon. They came with sandwiches, fruit and treats from home or enough money for the treats from the concession stand in the lobby. Doom, or Flaming Inferno, or Railway of Death. Ah, the Perils of Nyoka - crushed by gorillas, about to be spiked to death in the shrinking room. Kids waited eagerly, week to week, to see how she would escape certain doom. I am an incurable filmaholic and I watch Turner Classic Movies very often. So many of the films I see there or on other channels of that type, I first saw at the Pitkin, most of the 100 top films of all time. Casablanca, Best Years of Our Lives, Gone with the Wind, Goodbye Mr. Chips, Mrs. Miniver, Lost Horizon, all the MGM musicals. The Robert Mitchum film noir adventures. All the great comedies. The Pitkin was our eye on the world. Its newsreels shaped and ignited our patriotism in wartime. It was more than that. It was a destination, and a place from which images flowed to inform, to entertain and to change thinking. And for us, immigrants and the children of immigrants, caught up in our tight world of work and school, it was how we absorbed American ideas and values. Even to this day, those who once lived in Brownsville speak with deep affection for this movie theater. I feel it is a shame that it has been allowed to deteriorate this far. And I would suggest if anyone reading these pages has the money or the means or both to do something truly meaningful with it before there is any further deterioration. I would imagine, in the light of the gentrification of Brownsville, that the building could be restored and converted into a museum of Brownsville’s colorful turbulent history as a way station for different waves of immigration, while honoring the films that shaped two generations. Right hand page offers tickets to a Pitkin appearance in person of The Three Stooges, in tandem with cartoons. If such a renovation were to come to fruition, it could revitalize Pitkin Avenue and make it a destination again. Postscript: The fates of the lesser movie theaters in Brownsville and adjacent East New York. 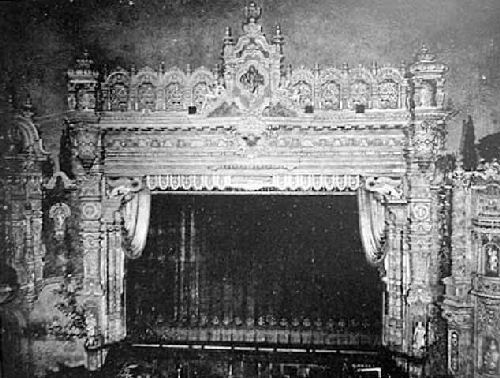 The Hopkinson Theatre, originally a live Yiddish theater and at one time a foreign film theater, was subsequently razed and is now a lot. The Stadium, where B mysteries like Charlie Chan were shown, met a similar fate and is now a small park. 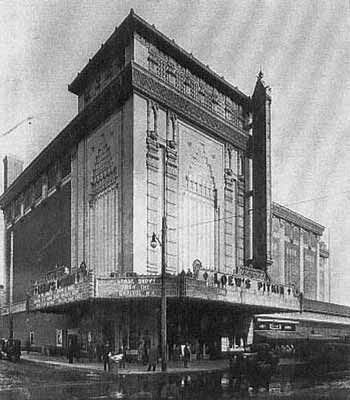 Loew’s Palace, the Supreme, the Ambassador, the People’s Cinema (nee Bluebird), the Livonia, The Lyric (Hendrix), Elite (Euclid), Kinema, Biltmore, Premier, Embassy, Warwick, Adelphi (Gem), Gotham, have ALL been demolished. Those that remain as churches include The Parkway, New Prospect (Ralph Ave.), the Montauk Arcade (Montauk) and Brair’s Theatre (Powell) both on Pitkin Ave, the Penn, Sutter, Miller (Jehovah’s Witness on site) all on Sutter Avenue. © 2007 by Sylvia Siegel Schildt. Ms. Schildt's book, "Brownsville: The Jewish Years," from which the above excerpt was taken, can be purchased here.